Thanks much, Mmmmmm, they all sound great. They definitely add a lot to the Orange Islands in my hack. Hey @Mmmmmm, think you could take a crack at the Aspertia City music? It's one of my favorite home town songs. So things got rather out of hand and I ended up procrastinating on this one song for a very long time due to frustrations with it. Just the intro took forever to make passable, though the rest of the song went a lot smoother. I still don't like how the intro turned out, and it's rather long, so for hacks that don't have TPPAC's/Polished Crystal's tweaked audio engine that resumes songs where they left off after battles instead of restarting them, I included a version of the song that cuts out the intro and starts the song at the main loop. I apologize for the long wait. I want to try tackling every song used in the southwest Unova expansion from BW2 one day, and I'll put this on my backlog. EDIT: Black City is also done. I had a bit of a dilemma on how the sustained notes on the waveform channel should sound. There was one very strong waveform that I wanted to use but it was just overpowering the other channels, so I had to settle with a weaker one. I apologize for the double post, but I finished the last two songs I needed to do for Polished Crystal 3.0. Maybe it was me seeing how close 3.0 was to release that lit a fire under me but I got them all out quickly. I decided to try a percussion-free battle theme for the XY legends, which will hopefully fit in fine since the other Legendary themes in the hack (to my knowledge) are all percussion-free, even if all my other themes have percussion, so hopefully that's alright with you, and I could try adding a percussion backing if you felt it necessary. I actually don't need the XY Legendary theme after all; as I said, I decided the three beasts' theme goes better with Celebi. However, it does sound good without percussion. Less intense and more peaceful, but that mood could work well for for some legendaries. So what are your priorities now? FYI, if you're doing more Unova demixes, I'm sure they'll be used for a just-started "Johto Black" game (like Kanto Black but with Gen 2 Johto instead of Gen 3 Kanto). I still have some other requested songs I need to do (some of them for a long time, because I prioritize songs needed for ROMhacks over regular requests) and then after that I'm not sure. If I were going to prioritize songs for a potential "demake" hack, I'd definitely go with Hoenn songs first, since Hoenn has had more attempts at being demade and is the only region to have a demake with an actual demo. I could definitely help with a Unova demake if one got off the ground and showed promise, though. I'll probably try to improve my compositional skills by remixing some Gen 1 songs that never made it to Gen 2, or finally try to make custom music for the Gen 2 Touhoumon hack (though I'm not sure now because it seems the author has gone away again). If I were going to prioritize songs for a potential "demake" hack, I'd definitely go with Hoenn songs first, since Hoenn has had more attempts at being demade and is the only region to have a demake with an actual demo. Not to mention too from what I've seen, the main channels needed are usually the first 3 when you rip the songs to midi. It almost seems like they designed RSE songs like the GBC ones, then added the extra channels after. Hey Mmmmmm, I have a few more Polished Crystal requests whenever you're free and don't have other queued songs. Edit: By the way, if you do any Touhou demixes, I'll add at least some to Polished Crystal's music player as bonus tracks. I have yet another request, but this one may interest you more: the B2/W2 Hidden Grotto theme. (No guesses what it's for. ;) I know the ambient nature sounds won't be possible to reproduce, but maybe something in RBY's more minimal style (or GSC's post-credits music), with the piano notes and some percussion that kind of resembles the leaves/water rustling. It's a fairly short loop, too. I had a request, but didn't know if you'd be interested or not because I haven't even began to touch the surface of pokecrystal hacking yet other than knowing how to use Cygwin and creating the roms for use. Hi Mmmmmm, I've got a question. Do you also cover requests of music other than from (Pokémon) games? For instance, a very popular radio hit song, or a house track by a famous DJ/producer? Life's gotten me down and kept me busy, so I haven't had much time to do hack music. I did get these three songs done over various points in time, and didn't feel like bumping the thread until I had enough to make a decent-sized post. To answer the questions about non-Pokémon requests, I try to stay as firmly within mainline Pokémon as possible. 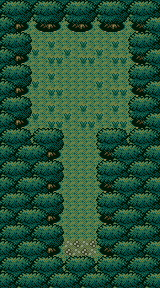 So far the only non-mainline songs I've done are the above battle theme from Pokémon Gale of Darkness, and a short menu loop based on one of the anime ending themes for Pia Carrot's Pokémon Orange (not linked due to its simplicity). I feel that as someone who primarily takes requests I need to avoid letting my scope grow too much, else I'll have such a large backlog that I'd never be able to climb out of it. Thank you for much for doing these, and I hope you feel better. I noticed Bloodless's planned GBC Hoenn hack was making quite good progress and I think it lit a fire under me, leading to me doing these last four songs in about a week. May's and Brendan's themes are of course simple edits from each other, but I'm still feeling good about doing so much after my hiatus. I think I'm going to narrow my focus toward songs for that hack, at least for the moment, to help push things along. Hey Mmmmmm, are you still doing GSC covers of newer stuff? I've been trying to get in contact to ask about commissioning music pieces for a hack I'm working on.